Two bedrooms shining and fresh 140 apartment with free public parking. Bright, large full equipped and renovated apartment in the core of Tuscany. This large apartment ( fully renovated, offers a pleasant, shining, fresh and convenient permanence in the core of Tuscany. It has two large bed rooms (25 two living rooms whose one with a large, new and fully equipped kitchen. The other living room offers a sofa-bed. There are 2 independent toilette and balconies-terraces with sunny and shining view. Washing and dishes machine are provided. The two balconies-terraces have also place for drying as they enjoy plenty of sunshine. The apartment is placed in a central and quiet zone of Montepulciano. Very accessible and close to the historical part of Montepulciano (100mt. ), the apartment is close to 2 large free parking (30mt.) and bus station (100mt. ), therefore very easy for luggage transportation (first floor after only 6 steps). Also, it is very close to shopping and food markets, local market (Thursday) bars and restaurants. Large, bright, modern, peaceful and convenient. Linens are provided when you check in but as an apartment is not possible to provide daily changes (Law). Free and safe public parking at 50-100metres far. Towels are provided when you check in but as an apartment is not possible to provide daily changes (Law). large, modern and full equipped kitchen and living room with aircon. The apartment was very spacious with lots of light. The two bathrooms have been remodeled and were well done! We had 4 adults and used the two bedrooms plus the hide a bed and we were very comfortable. The kitchen is large with a table and a sitting area. The apartment is a very short walk to the center of Montepulicano and we enjoyed walking through the town and visiting the wine shops, cheese shops, and local crafts. The views are beautiful throughout the whole area. We also did a private wine tasting at Icario which is a short drive from the area. Pienza was another fun stop and the drive was less than an hour. Beautiful, sunny, comfortable beds (a rare thing in Italy, for sure), great location. Only one downside - it's right next to a school. So if sleeping is is a must, bring ear plugs. The noise is not too bad but it's all at once around 8am. Kitchen was very well supplied with dishes, pots and pans. Big and bright. Thank you!!!! Many thanks for your beautiful review. You also have been very nice guests. Regarding the noise you heard for those 10 minutes around 8am I am sorry but for those few days the other street was closed and the municipality had to make walk people closer to left side of the apartment. All the best! Great location-so close to everything and within walking distance to town. Apartment was spacious and had the best shower. When we arrived, Elias welcomed us warmly, showed us around the apartment, and recommended places to go and to eat. Everything was clean, in order, and well-stocked, including coffee and drinks in the fridge. There is so much space! I especially liked having a large bathroom, which includes a (teeny, tiny) washer. Large French doors open onto balconies with views of the countryside and parts of the town. The weather was perfect, and not only did we drink coffee on the balcony in the mornings, but we slept with the windows open. From this apartment, you are a short walk to the historic center of Montepulciano. On the way, you pass a large grocery store and a great local pizza place called Pizzeria Rosticceria Linda. Elias was very responsive, and out of all the places we stayed while in Italy, he was by far the most hospitable! The only constructive criticism I would offer is perhaps trade the turquoise sofas in for something a little more neutral. :-) We would definitely stay here again. Thank you, Elias! Many thanks! Much appreciated your beautiful review! 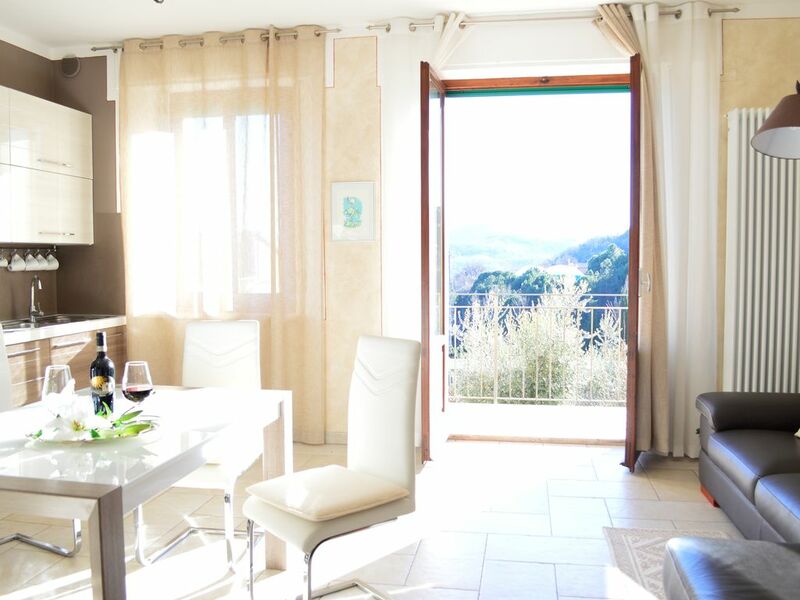 Your Apartment and Montepulciano Met All My Expectations! Thank you for being such a gracious host and helping with our transportation needs. I loved the location of the apartment and being part of a real Tuscan neighborhood for almost two weeks, rather than being isolated in a more touristy area. All the necessary amenities were close by: a large, modern grocery store, a wonderful neighborhood bakery and coffee shop,and of course, all the wine cantinis and restaurants in old town only a short walk away. Everything was so convenient and there was so much variety that we rarely left Montepulciano. Your large apartment was perfect for my family in that it provided both privacy and a great gathering area in the kitchen/family room for many great meals and conversations with lots of wine. It was great to have such a place for a home base just to slow down and enjoy the essence of the Tuscan culture. We'll always treasure our Tuscan adventure. Dear Connie! I so glad to get your very nice review and know you had such a wonderful stay. You have been super nice guests! Many thanks! This apartment is in the core of Tuscany. It is placed only at about 100 metres far from the historical centre of Montepulciano. Montepulciano is popular for its long history from Etruscan, middle age, 'Rinascimento' and its high quality red wine. Here is perfect for short or long term holidays for relaxing, historical and museums-churches-buildings tours, wine tasting and countryside walking and view.